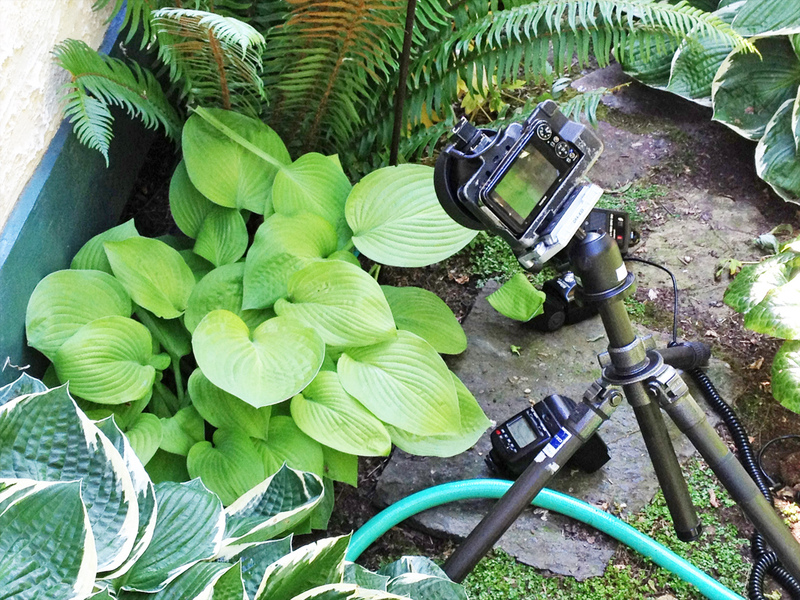 We asked Bob Venezia to share some details of how he created the hosta photos he showed at the June 2013 meeting. As many of you know, my W3 is normally attached to my Cyclopital macro adapter. The adapter with the camera is a really fine combination and opens the door to new possibilities. Besides reducing the interocular spacing the adapter provides a hot shoe, opening the door to off-camera flash. And I love the off-camera flash! I have a number of slave-able flashes and I was playing in the garden to see what effects I might get from backlighting leaves. 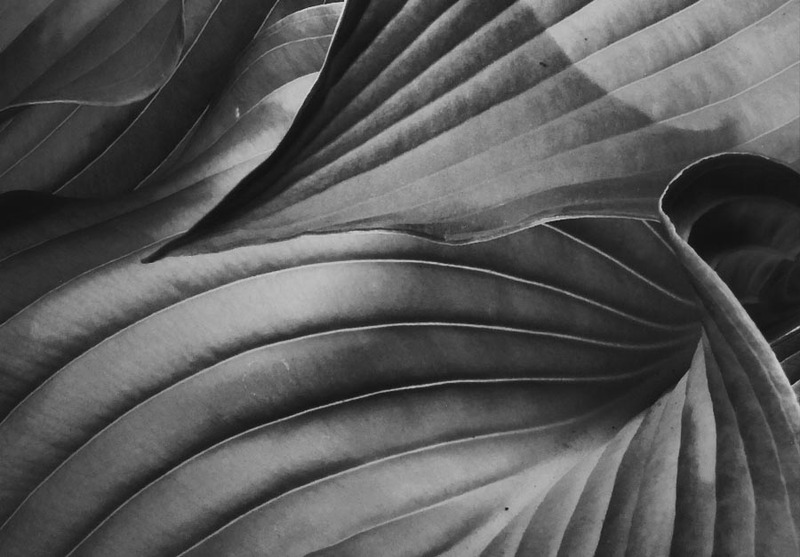 The results from the hosta took me totally by surprise (the lesson here is that it’s important to play). The backlighting of the leaves was cool but what amazed me was the depth and texture that was revealed by the close-up 3D. One of our hostas as is. When I shoot close up 3D in the garden I often bring a tripod, a couple of light stands, and a bagful of flashes. I stick a long dowel through the umbrella holder of one light stand and use this to drape some black velvet so I can limit my background. 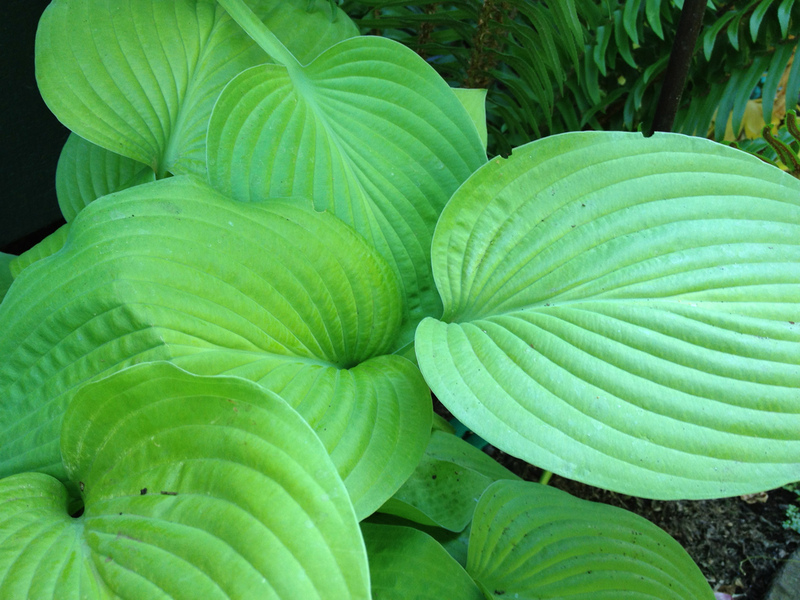 But for the hostas I dispensed with the velvet and filled my frame with layered leaves. 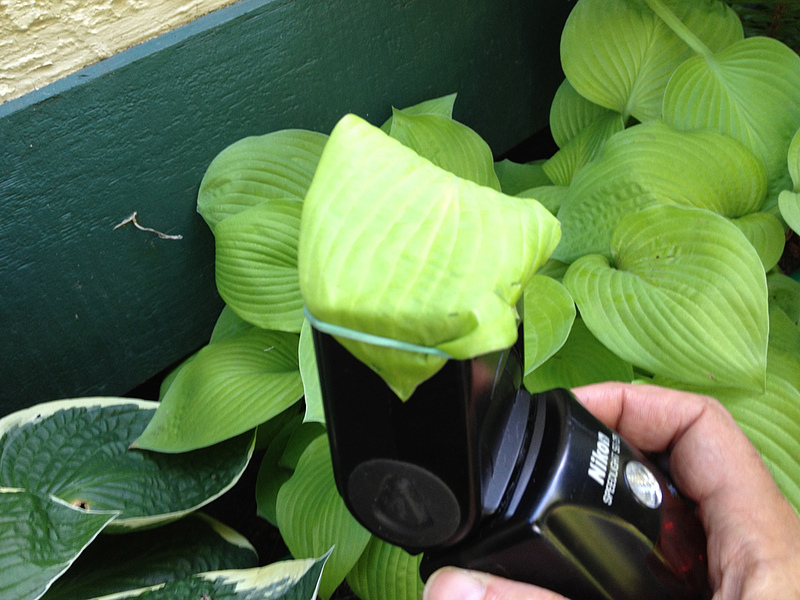 The camera on a tripod aimed low at the hosta. 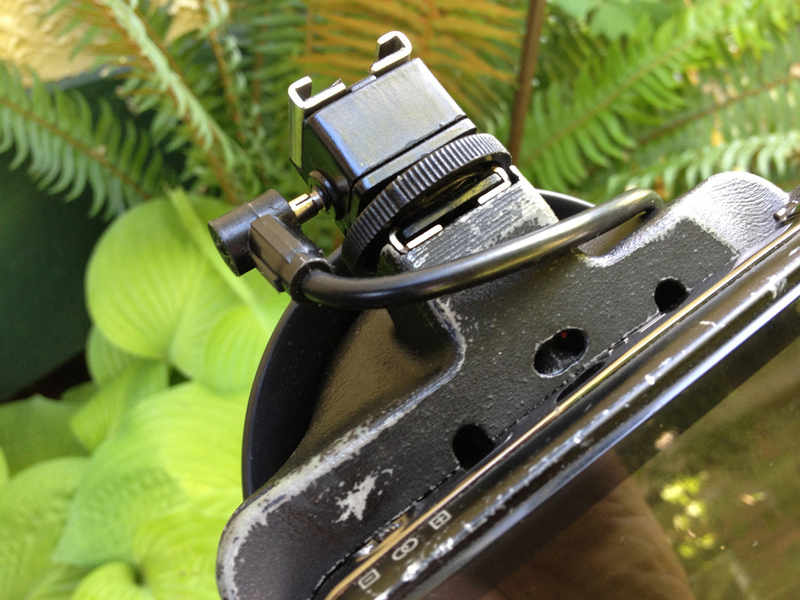 An adapter on the hot shoe is used to connect a flash on a cord. The picture I showed at the meeting looked pretty good right out of the camera. Here it is trimmed for the stereo window. To do the Black and White conversion I played with the Photoshop function Image→Calculations. I chose the Green channel for a couple of reasons. This being a predominantly Green image the Green Channel was the brightest. And the Green channel Often has the best quality information in it. I set the Result to be a New Document. Note that it will be created in the Multichannel format. 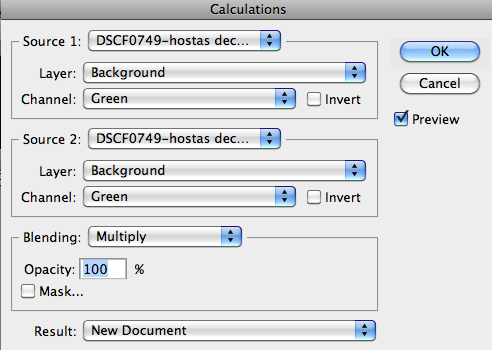 To get it back to RGB, choose Image→Mode→Grayscale, and then Image→Mode→RGB. Now to go a little more crazy, I might duplicate the layer several times and experiment with filters, blend modes, and opacity. 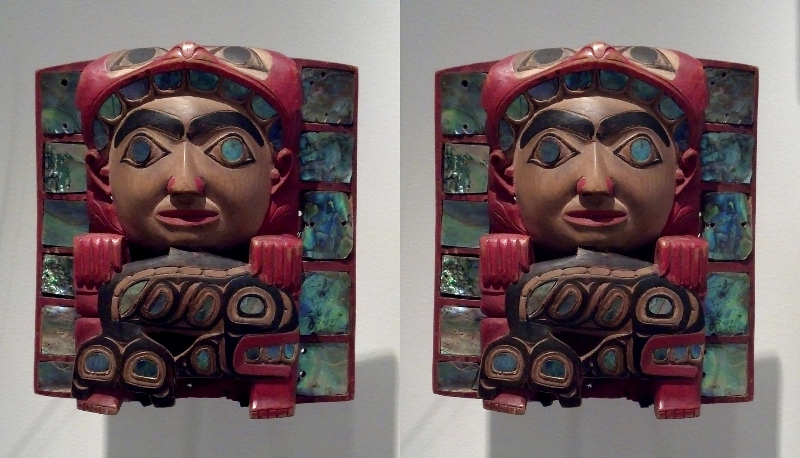 On my last visit to the Seattle Art Museum I decided to try to make some macro cha-cha photos with my cellphone. It was fun to put them together and it was a good learning experience. I’ll explain what I did here, and what didn’t work very well. 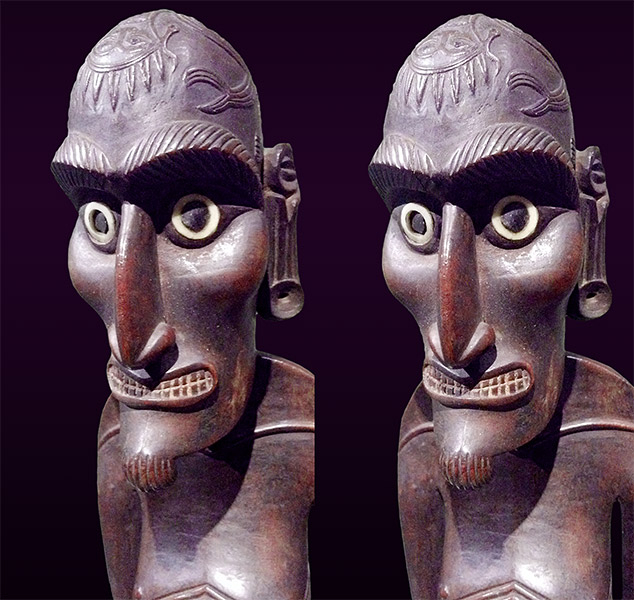 The cha-cha technique, briefly, is to take two successive photos with the same camera from different positions, then later assemble the images side-by-side into a proper stereo pair. For this experiment, I set my cellphone camera to it’s macro setting, held the camera up flat to the museum exhibit glass (when no one was looking), took a photo, then slid the camera slightly to the right to take another photo. The closer the subject, the less I moved the camera. In most cases I slid the camera horizontally only about 1-2 inches. Some subjects were a little further away so I slid the camera slightly more. It wasn’t very scientific, but that was part of the fun. 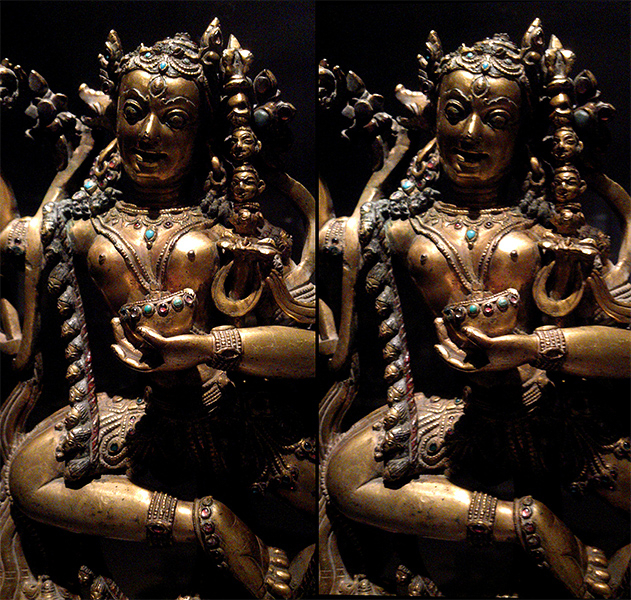 One or two have a slightly hyper-stereo look to them and I sort of like the result. 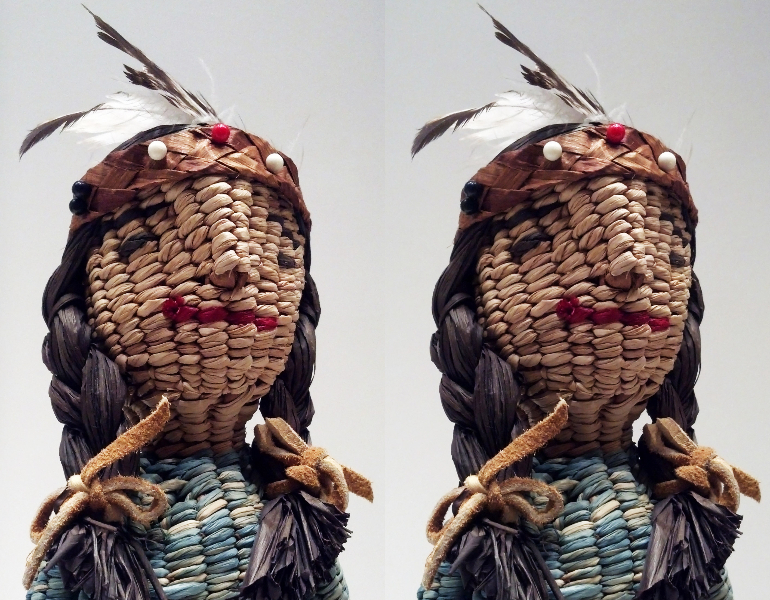 These images are in cross-eye mode. I tried another technique that didn’t work well. That was to set the camera to the “multi-shot” setting so that it would take 5 shots in quick succession (within about one second) and while it was shooting, I slid the camera to the right. In theory, I’d be able to pair the first image with each of the subsequent images to get stronger and stronger stereo effects, and I would pick the best pair. In fact what happened was that I got one clear image (the first one) and four blurry ones. Shooting separate images gave much crisper results. Next time, I may just shoot 5 separate images with the camera held still each time, THEN try to assemble the best pair. Another thing that didn’t work too well was shooting at some distance, particularly without the support of the glass case to keep the camera still. 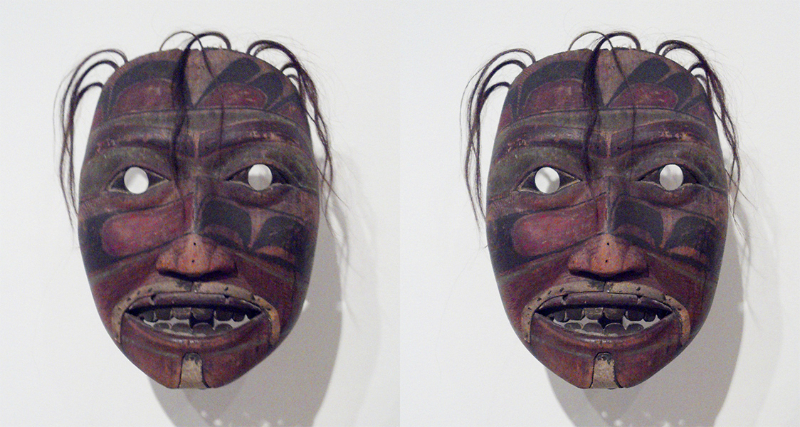 That’s when the noisy CCD in my camera and my unstable hand-held shots become particularly noticeable, as with the Pacific Northwest mask. 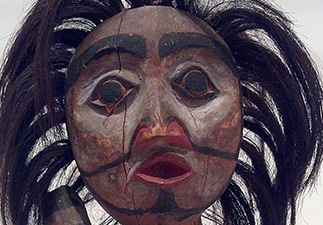 The museum environment is kept intentionally dark, so it really helps to get close and be still. 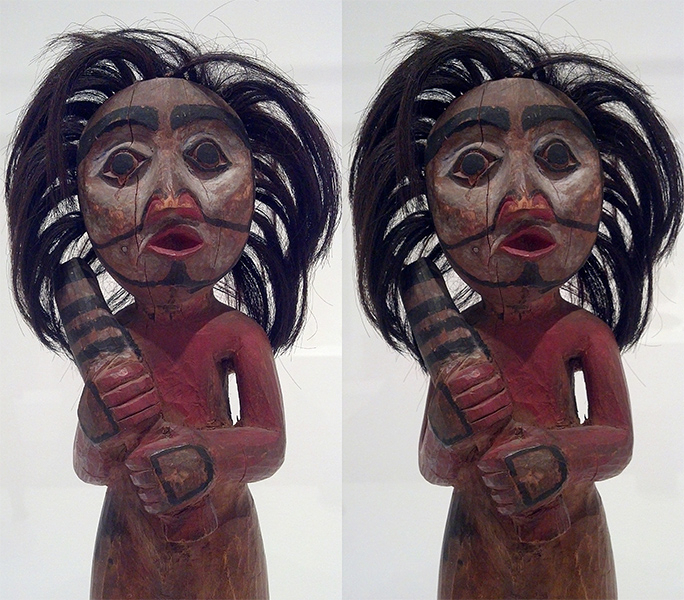 And, by the way, shooting photos of art in the Seattle Art Museum is expressly allowed for most of the art objects in the museum.